In 1919 William Peters McMaster and Lena McMaster purchased ten acres of bare ground from the Terra Bella Land Company. 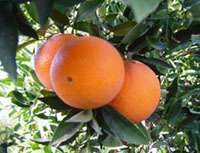 Over the course of the following 80 years the property would be developed by their son, Frank McMaster, into 90 acres of citrus, including many specialty varieties. This site is a tribute to my father and his work, and will provide information regarding the varieties we grow, the history of our farm and production planned for the future. Feel free to contact me with any questions or comments.